For your New Year - Literacy Conference! News of a Literacy Conference has come to our attention. We recommend it strongly to all our readers. Each day of the Conference starts with a spelling error - see if you can spott it! Its not hard. If you can, you can win a can of beer that can brighten up your day if you can. There are allso grammattical erors and little turns of phrase that r not quite aceptable. For instance, if I where to write "I do not have the wherewithall" and you were to spott it, you would win a prise. Build competence, buid confidense day by day as you lumber through this conference mase off speaker's, all chosen personally by us for there literacy. So start to look for the errors, starting now, getoff to a good start at the start and you wil never lookback to were you started (at the start)! Later on you can look back if you want and you will be surprised at what you see – I was! Honestly, I was realy terible! And what made it worse was Spelcheck (notice it’s even spelled wrong!). So I had to turn it off, and then I improved a lot. We will show you how to do the same (Day 3, 4.30 PM, “Winning against Spelchek” with Dr How). Fill in the form attached to reggister and be sur to send yr money. 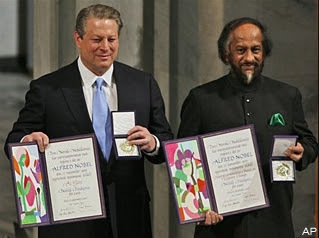 He shared the prize with Rajendra Pachauri, the U.N. climate panel's chief scientist. "We, the human species, are confronting a planetary emergency - a threat to the survival of our civilization that is gathering ominous and destructive potential even as we gather here," Gore said at the gala ceremony in Oslo's city hall, in front of Norway's royalty, leaders and invited guests. Gore urged China and the U.S. - the world's biggest carbon emitters - to "make the boldest moves, or stand accountable before history for their failure to act." Gore drew a parallel between leaders who ignore the climate crisis and those who didn't act as Nazi Germany rearmed before World War II. "Too many of the world's leaders are still best described in the words Winston Churchill applied to those who ignored Adolf Hitler's threat: 'They go on in strange paradox, decided only to be undecided, resolved to be irresolute, adamant for drift, solid for fluidity, all powerful to be impotent' ", Gore said. With Australia signing the Kyoto agreement there is a new impetus to take climate change seriously. In fact, we may be raising the bar we have to get over. "This is the first official act of the new Australian government" said the new Prime Minister Kevin Rudd. Professor Barry Brook, director of the Research Institute for Climate Change and Sustainability at the University of Adelaide, says ratifying Kyoto in itself is not a fix for climate change (ABC's News in Science service). "It is an illustration of the fact that we are now serious about it and we are moving into Kyoto phase 2 with action rather than delay in mind." About 190 nations are in Bali seeking a breakthrough for a new global pact to include the US and developing countries to fight climate change. The new treaty is meant to widen the Kyoto Protocol, which binds 36 industrial countries to cut greenhouse gas emissions by 5% below 1990 levels by 2008-12. Professor Matthew England, from the Climate Change Research Centre at the University of New South Wales, talks of a world, post-Kyoto. "The next step is to secure the future by establishing a post-Kyoto accord; one that is legally-binding and that minimises the risk of dangerous climate change." And what about us? Most Australians will make their personal effort, whether small or large. Business will be divided into two groups: those who see it as a cost and limitation, something to be avoided (evaded? ), looking for 'greenwash', and those who see it as an unrivalled opportunity. Leaderskill will assist all those who seek to find the opportunities in slowing or stopping climate change. Sustainability Planning is the order of the day, with its three decade old methodology, Mega Planning - the only way to ensure that your organisation becomes sustainable and you and everyone else benefits.